So I’ve officially hopped on the Matcha trend and I am now absolutely in love with Matcha anything. I’ve always known what Matcha is, but have always refrained due to lack of interest. Lately, I’ve been seeing tons of people posting their Matcha lattes or any other flavored item and it completely sparked my interest. For so long I’ve always thought it was an item you drank, and didn’t think of the endless cooking possibilities. Matcha is highest quality powdered green tea available. It packs so much flavor and is great in a drink but could also be translated into many different dishes. One in particular that I have been loving lately is matcha pancakes. 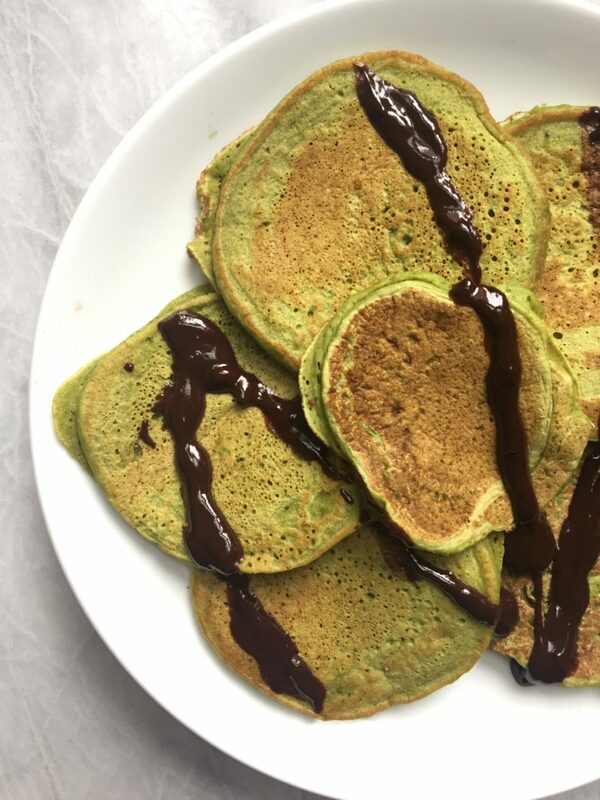 The slight hint of Matcha adds such a different dimension to your standard pancake recipe and the color doesn’t hurt either! I paired it with the easiest chocolate sauce ever that takes a couple of minutes to whip up and compliments the flavors so well. If you make these, don’t forget to “tag” me on Instagram so I can see them! Combine all dry ingredients together and mix to combine. Add your wet ingredients into dry and combine two together. Heat pan on medium and grease with cooking spray. Cook pancakes for 2-3 minutes on each side or until sides firm up and bubbles form on the top. Combine butter and chocolate and cook in microwave in 30 second intervals until completely melted. If mixture is thick, add some hot water to thin it out. *I haven't tested other flours besides plain white flour.